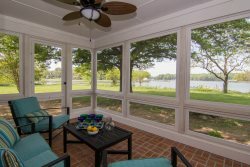 This beautifully decorated Harris Creek waterfront home is waiting for you! With plenty of room for multiple families to vacation together, you'll create lasting memories at Emily's Lane. Located in the little village of Wittman, just outside of historic Saint Michaels, Emily's Lane has just what it takes: a great pool, a waterside deck, and comfortably furnished screened porches on both the front and back of the house. The freshly renovated interior offers hardwood floors throughout, beautiful, modern furnishings, and two master suites. Two additional bedrooms and two daybeds in the upstairs hallway provide sleeping space for many. Fireplace: Firewood is not provided.